<?xml:namespace prefix = "o" ns = "urn:schemas-microsoft-com:office:office" />This romantic ring from Alex Monroe captures a simple sentiment beautifully. 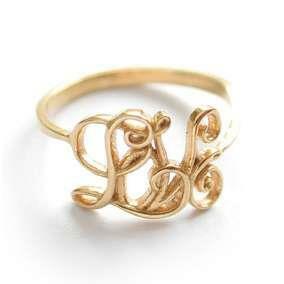 The word 'Love' is delicately crafted in 22ct Gold Plated Sterling Silver in an intricate, intertwined cursive script. A perfect gift to tell that special someone just how you feel! Please specify size in the notes box when ordering. Note: Due to this item being an end of line product it will not come in designer packaging or with a warranty.